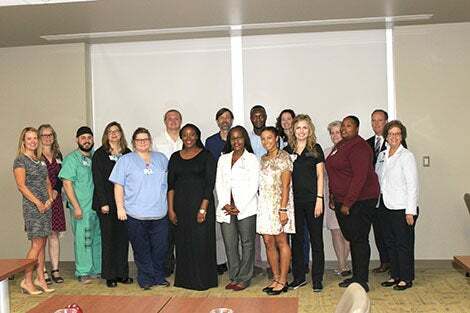 Pensacola, Fla. (July 30, 2018) – The Baptist Health Care Foundation awarded 32 scholarships to Baptist team members and family dependents who are continuing to further their educational goals. Thirty of the recipients received $1,000 scholarships from the Helping Hands fund, a team member giving program of the Foundation. Two recipients were each awarded $2,500 through the Luther and Kathy Taylor Nursing Scholarship Endowment this year, which was established through the generosity of the Taylor family in 2008 to assist students as they pursue a nursing degree. Helping Hands scholarship recipients are: Kimberly Baker, Mason Baker, Tarsha Banks, Destiny Bellow, Brittany Bickham, Alyssa Brownell, Michelle Davis, Beverly Gonzales, Claire Goss, William Herring, Todd Infinger, Nova McDavid, Richard Melton, III; Nancy Miguez, Clinton Miller, Kim Murphy, Shelli Myers, Linda Odum, Skye Pinder, Rachel Rhodes, Jessica Rife, Veronica Rosa, Katrina Snider, Stephen Soderlind, Emerson Soto, Vamina Stevenson, Shannon Taylor, Mohamed Toure, Lindsay White and Wendy Zwald. Luther and Kathy Taylor Nursing scholarship recipients are: Megan McCray and Heather Olmstead. In more than 10 years the Foundation has awarded more than $200,000 in Helping Hands scholarships and $45,000 in Taylor scholarships. To learn more about the Baptist Health Care Foundation, call 850.469.7906 or visit BaptistHealthCareFoundation.org.